Compare the present carving to an earlier Ming dynasty celadon jade group of similar composition, included in the Min Chiu Society Thirtieth Anniversary Exhibition, Selected Treasures of Chinese Art, 1991, illustrated in the Catalogue, no. 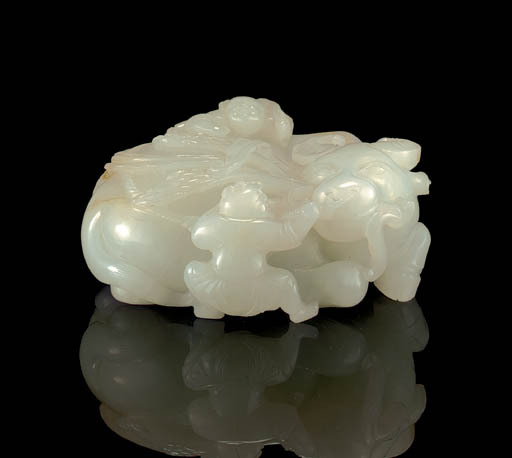 219; an early Qing dynasty white jade group from the Gerald Godfrey Private Collection of Fine Chinese Jades, sold in these Rooms, 30 October 1995, lot 893; and another, dated to the 18th/19th century, sold in these Rooms, 28 April 2004, lot 1230. The subject of the buffalo and its boy minders is very popular and can be found in paintings, ceramics, bronzes and in jade carvings from the Yuan dynasty through to the Qing.